Hue City, Vietnam, April 20, 2017 -- A ground-breaking partnership has resulted in the protection of more than 240,000 hectares of forests in the Central Annamite Mountains joining Laos and Vietnam, the discovery of new wildlife species – including the re-discovery of the saola -- and the creation of a world class forest guard system, WWF said today in celebrating the conclusion of the six year programme. The Carbon Sinks and Biodiversity Project (CarBi) is the largest and most ambitious transboundary programme in the history of WWF’s involvement in the Greater Mekong region. Supported by KFW, CarBi is a partnership with the Governments of Vietnam and Laos, development partners and other donors, local governments and local communities. Its goal is to halt deforestation through forest protection and sustainable use of forest resources, while preserving the unique species diversity of the Central Annamites, one of the world’s most biologically diverse ecosystems. The partnership’s name comes from the central idea that avoiding deforestation and restoring degraded forests is essential to the preservation of biodiversity and the ability of forests to store carbon. Releasing carbon dioxide through deforestation is a major cause of climate change. “Over the past six years, the Governments of Vietnam and Laos have worked with local communities in the Central Annamites to do something unprecedented -- create a world class protected area system with highly trained forest guards, thousands of hectares of restored forest and the discovery and protection of some of the Planet’s most endangered species,” said Fanie Bekker, Transboundary Director, CarBi. The numerous successes of the CarBi Partnership include an extensive camera trapping monitoring programme, in partnership with the Leibniz Institute for Zoo and Wildlife Research, that has conducted more than 67,000 trap nights in the past six years. Highlights include the rediscovery of the Saola in Vietnam – one of the world’s rarest large mammals -- by a CarBi supported camera trap survey in 2013 after it had not been recorded for 15 years. Biodiversity surveys have revealed a new snake species and improved our understanding of the presence of species such as the Asiatic black bear and Annamite Striped Rabbit. The CarBi Forest Guard system has developed a robust track record of world class patrolling and data collection, and more than 100,000 snares have been removed and 1,800 logging camps destroyed. 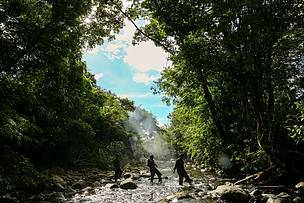 In addition, the management effectiveness of protected areas has improved on average by more than 90%, and the development of a conservation economy has resulted in 16,300 beneficiaries participating in activities, and 170,000 work days generating around $1.8 million USD in income. This has measurably reduced the pressure on forest resources by providing sustainable alternatives to logging, poaching and other destructive activities. In partnership with provincial and national counterparts, CarBi promoted improved forest management and control of illegal wildlife and timber trade in bordering provinces to ensure the connectivity of Laos and Vietnam green corridors As a result, the Laos Government tightened the control of logging and introduced a moratorium on the export of timber from natural forests, resulting in an 84 percent drop in exports of round wood from Lao PDR to Vietnam in the first six months of 2016. “CarBi has made significant contributions to forest protection and cutting edge biodiversity conservation. A number of successful activities have been carried out, including capacity building and awareness raising, extensive law enforcement, biodiversity monitoring, forest restoration, supporting payment for environmental services, as well as engaging local people in biodiversity conservation, resulting in enhanced and diversified livelihoods. CarBi has created some fresh motivation for biodiversity conservation activities in Quang Nam Province,” said Phan Tuan, head of Vietnam’s Quang Nam Forest Protection Department, and Director of the province’s CarBi’s Project Management Unit. 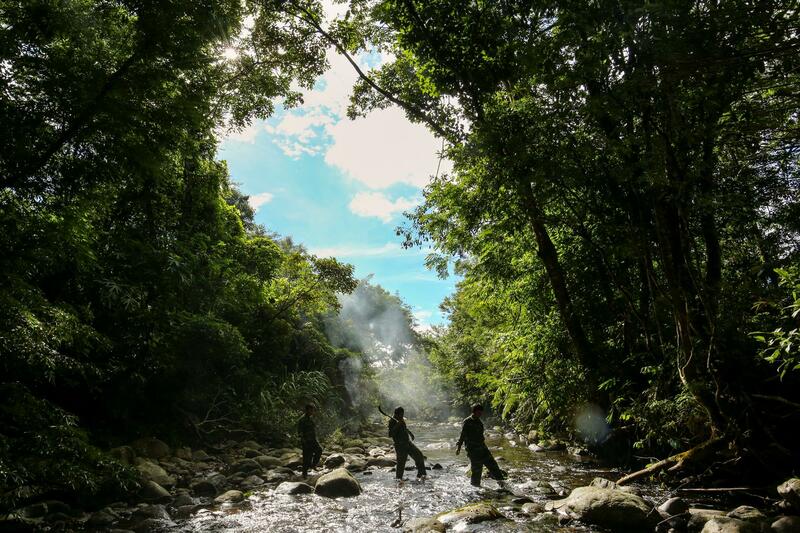 "CarBi has provided us with a clear window into the unique biodiversity treasures of Xe Sap, and also supported the Laos government to enhance its management effectiveness significantly. The piloting of the Biodiversity Conservation Agreements with selected communities, has also paved the way for upscaling in other areas of Laos,” said Keophaylin Ngonephetsy, Government Project Coordinator, Department of Agriculture and Forestry, Xekong Province.